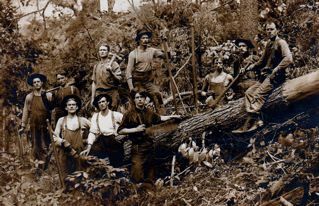 Comments: Blaine Adam ROSS (Nee: ) | Cherry Tree PA United States | 1901-1920 | Comments: A logging team working in WV. Most likely the men are all from Indiana County, PA but no data to support that theory. My grandfather worked there before he was married so it must have been about 1910. He is the subject with the moustache standing center, Blaine Adam ROSS of Cherry Tree, Indiana County, PA. Perhaps someone can identify others in the photo.